Sacalas experienced a small engine fire in the first 3 miles of the race but persevered and moved into 3rd place by race mile 20. Unfortunately, at approximately race mile 34 Sacalas lost a unit bearing and his front driver wheel fell off the vehicle. A replacement unit bearing was sent out with the 4410 car driven by Curtis Warner who unfortunately suffered a rollover before handing off the parts causing a setback of more than an hour and a half for Sacalas. Eventually the parts were delivered and Sacalas repaired the car. 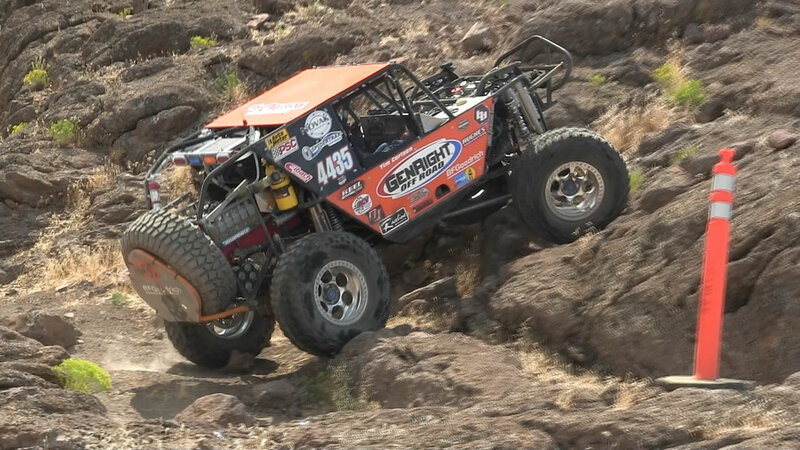 The 4435 car made its way effortlessly through the rock gardens that had caused trouble all morning for teams, and it appeared that Sacalas could still finish the 130 mile race. Unfortunately, the brutal course once again took its toll on the car and Sacalas lost a rear wheel after several studs broke loose. Using remaining parts from his broken hub, Sacalas was able to repair the 4435 car enough to self recover, but did not have enough replacement studs to maintain race speed and return to the main pits with enough time to finish the race. Sacalas will actually be racing as part of Team GenRight twice more this season, both at Glen Helen Raceway. He will be racing in the Ultra4 Class at the Lucas Oil Regional race on October 1st and will be returning to Glen Helen for the Ultra4 Racing finale on October 22nd.